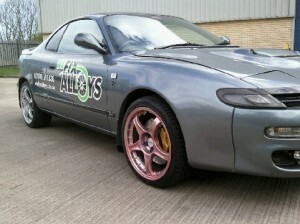 If you have fitted alloy wheels to your car then you know the importance of keeping these clean and in good condition. Some drivers like to fit winter wheels on their vehicles, which are a bolt-on solution for those harsher winter conditions and this can be a great and cheap investment. However, if you don’t want to do this, then you need to protect your alloy wheels from the extra grit and salt as well as other corrosive materials found on roads in the colder months of the year. Brake dust is another of the major problems you might have with your alloy wheel and this can prove to be rather hard to clean off or remove. This dust is released every time you apply your brakes. It is caused by the friction on the discs and pads and is a mixture of metal filings, carbon fibres and adhesive residues. Although you can purchase many products to clean away this dust and you should do this as frequently as possible, we would recommend soap and water. Some of the proprietary cleaners contain acid and this can damage your alloy wheel further. If you regularly wax your alloy wheels just as you would paintwork, then they will remain in good condition and reduce the risk of any corrosion from occurring. Alloy wheels add a certain look to any vehicle, however, if they are not kept in good condition, then the look is spoilt, and your alloy wheels will start to show signs of rust. Not only do the wheels look unsightly but eventually this can cause structural damage to the wheel itself. Keeping your wheels in perfect condition is important to road safety. You have to keep an eye on them with routine checks not only to clean away any dust and debris to keep them looking as good as new, but to keep your vehicle safe on the road too. Recent MOT changes include checks on your alloy wheels so if you have any concerns please visit us for advice, repair and refurbishment. In summary then, here are a few helpful tips to keep your wheels looking brand new. 1. Clean your wheels at least two times a month. We recommend simply using soap and warm water, as alloy wheel cleaners can contain acid based chemicals that may remove some of the wheels’ finish every time you use them. Keeping your wheels clean will prevent any dirt or brake dust permanently sticking. 2. Use a good quality wheel wax to protect and shine your wheels every time you wash them. Again this prevents dirt sticking and becoming very difficult to remove. 3. When you clean your wheels, spend extra time cleaning out all of the little gaps. If left, these areas of dirt can become very hard to remove and will form pockets for corrosion that will begin to permanently damage your alloy wheels. 4. Driving tips – read our winter driving tips to ensure you are as safe as possible and you can reduce the chance of curbing and damaging your alloy wheels. Unfortunately if you have not been looking after your wheels and they have started to corrode and become damaged there is only one option – they need to be repaired and refurbished and we know the best place for that! For more friendly and helpful advice about expert care for your wheels visit We Fix Alloys – alloy wheel repair Newcastle and the North East.